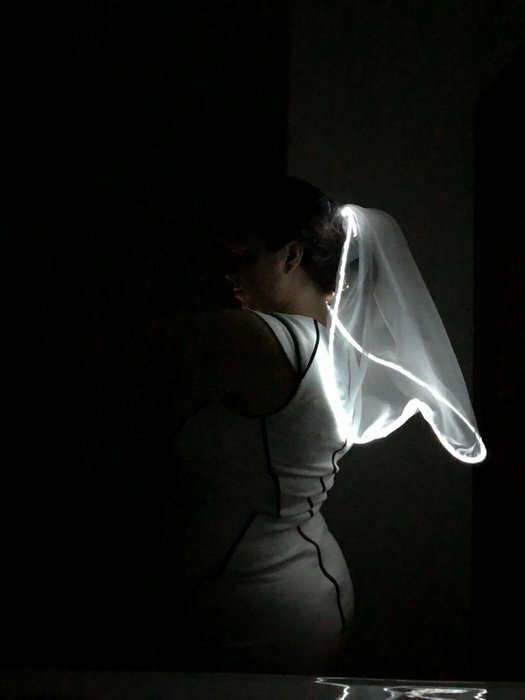 EL Wire Bridal Veil #WearableWednesday « Adafruit Industries – Makers, hackers, artists, designers and engineers! The style for our wedding is shaping up to be something that I’ve been calling “Future Minimal”. The color pallet is pretty much black, white, metallic silver, and hints of clear. I have had the plan to make edge-lit acrylic table numbers for the wedding since at least the beginning of our engagement (might put those up in another post – stay tuned!). I attended an LED class at my local Makerspace to learn more about how I could best make 12-20 edge lit signs for the wedding. At that class, I got to check out EL wire, which I had seen used in costumes, but had forgotten about. After that class, I had the bright (See what i did there?) idea to try to make a glowing veil using the EL wire.